Explore the magical world of celestial labyrinths! Find out about their meanings and how to use them to improve the body, the mind and the spirit. Learn how to draw and construct each of them, download the labyrinth posters and enjoy in the nine celestial labyrinth meditations! Welcome to the magical world of labyrinths! These ancient symbols are actually “patterns of power“ for redirecting energy, creating balance and healing the spirit, the body and the environment. 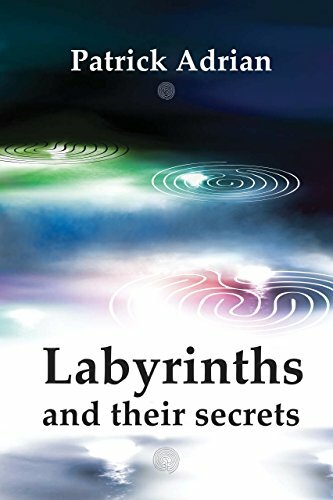 You can use labyrinths to improve your self-confidence, emotional stability, increase the level of energy, improve communication, intuition, relationships, gain spiritual knowledge and work at the deepest level in virtually any field of life. Labyrinths are geometrical patterns with the ability to enliven the seeds of inner knowledge directly in your consciousness. You can walk through them, but you can also use them in your home. Take the Seminar "Labyrinths and their Secrets" (firts two steps are free!) and learn about labyrinth seed patterns and how to draw and construct labyrinths from them. Explore their symbolism and enjoy especially designed labyrinth meditation for each of the nine celestial labyrinths. Come, walk the labyrinths with me! See you in the Centre! Learn about the difference between a maze and a labyrinth, download the free chapter from the book "Labyrinths and their secrets" and start the journey into the magical world of labyrinths! More about ancient mistery of labyrinths - a free chapter from my book "Labyrinths and their secrets". Learn about nine celestial labyrinths, their names and symbolism, and get a glimpse of what you will receive if you continue with this Seminar! The book or the Siminar? Overview of the content of the next nine steps; how and when to use the knowledge about labyrinths and an explanation of the background sounds in labyrinth meditations. How does the labyrinth sound? Learn about the Labyrinth of Power: what it does and how to construct it. Use the labyrinth meditation to invoke its effects. Download the designed picture of the Labyrinth of Power. You can put it on your screen, or print it out and use it in the labyrinth meditation. How does it feel during a labyrinth meditation with the Labyrinth of Power? Have you constructed a walking size labyrinth? If you wish, describe the experiences you have with this labyrinth. Learn about the Labyrinth of Feelings: what it does and how to construct it. Use the labyrinth meditation to invoke its effects. Download the designed picture of the Labyrinth of Feelings. You can put it on your screen, or print it out and use it in the labyrinth meditation. How does it feel during a labyrinth meditation with the Labyrinth of Feelings? Have you constructed a walking size labyrinth? If you wish, describe the experiences you have with this labyrinth. Learn about the Labyrinth of Energy: what it does and how to construct it. Use the labyrinth meditation to invoke its effects. How does it feel during a labyrinth meditation with the Labyrinth of Energy? Have you constructed a walking size labyrinth? If you wish, describe the experiences you have with this labyrinth. Learn about the Labyrinth of Connection: what it does and how to construct it. Use the labyrinth meditation to invoke its effects. Download the designed picture of the Labyrinth of Connection. You can put it on your screen, or print it out and use it in labyrinth meditation. How does it feel during a labyrinth meditation with the Labyrinth of Connection? Have you constructed a walking size labyrinth? If you wish, describe the experiences you have with this labyrinth. Learn about the Labyrinth of Wisdom: what it does and how to construct it. Use the labyrinth meditation to invoke its effects. Download the designed picture of the Labyrinth of Wisdom. You can put it on your screen, or print it out and use it in labyrinth meditation. How does it feel during a labyrinth meditation with the Labyrinth of Wisdom? Have you constructed a walking size labyrinth? If you wish, describe the experiences you have with this labyrinth. Learn about the Labyrinth of Love and creativity: what it does and how to construct it. Use the labyrinth meditation to invoke its effects. Download the designed picture of the Labyrinth of Love and Creativity. You can put it on your screen, or print it out and use it in labyrinth meditation. How does it feel during a labyrinth meditation with the Labyrinth of Love and Creativity? Have you constructed a walking size labyrinth? If you wish, describe the experiences you have with this labyrinth. Learn about the Labyrinth of Life and death: what it does and how to construct it. Use the labyrinth meditation to invoke its effects. Download the designed picture of the Labyrinth of Life and Death. You can put it on your screen, or print it out and use it in labyrinth meditation. How does it feel during a labyrinth meditation with the Labyrinth of Life and Death? Have you constructed a walking size labyrinth? If you wish, describe the experiences you have with this labyrinth. Learn about the Labyrinth of Transformation: what it does and how to construct it. Use the labyrinth meditation to invoke its effects. Download the designed picture of the Labyrinth of Transformation. You can put it on your screen, or print it out and use it in labyrinth meditation. How does it feel during a labyrinth meditation with the Labyrinth of Transformation? Have you constructed a walking size labyrinth? If you wish, describe the experiences you have with this labyrinth. Learn about the Labyrinth of Freedom: what it does and how to construct it. Use the labyrinth meditation to invoke its effects. Download the designed picture of the Labyrinth of Freedom. You can put it on your screen, or print it out and use it in labyrinth meditation. How does it feel during a labyrinth meditation with the Labyrinth of Freedom? Have you constructed a walking size labyrinth? If you wish, describe the experiences you have with this labyrinth. A vision beyond nine celestial labyrinths; special constructions, city of labyrinths and more.